Dear El + Em: My First "Blate"
If you follow us on Twitter, or Instagram (etc. ), you would know that last night I went on my first "blate" (blog date) with Mallory from Mals Miles!!! We decided we aren't big fans of the term "blate", but for the purposes of this post...I'm going with it! The hubby's came along too, so I guess it was a "double-blate"? I jokingly texted her and said we would be the ones holding a red rose...HA! Anyway, it turns out Mallory's parents live RIGHT by us (I could probably throw a rock at their house...but I won't), so when she found out how local we were she e-mailed me to let me know about her upcoming trip! I was so glad we were able to meet up for dinner, so much fun to get to know them! Mallory and DLW are the absolute CUTEST! Too bad they live so far! I'm hoping we get to see them again next time they are in town! 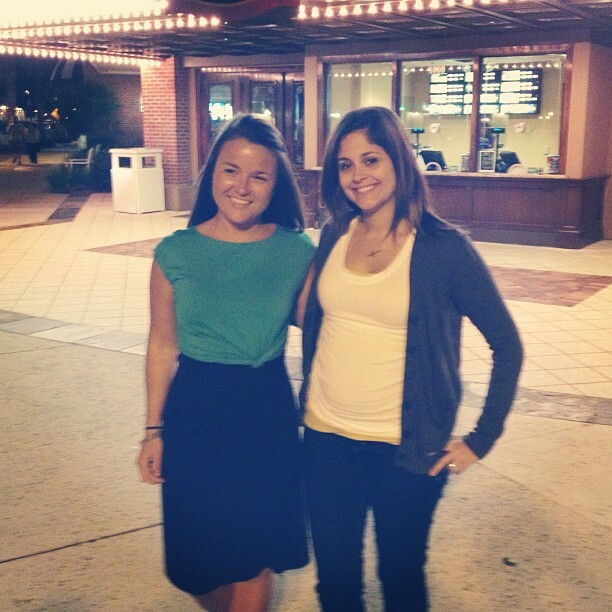 It was dark out by the time we finished dinner, but we HAD to take a picture anyway (of course)! We had a yummy "Nutty Cheesy Salad" for dinner....I'm determined to recreate this SOON! So cute. Hope you guys have more blates! Aw, I love Blates! It sounds like this was a good one. And also, a nutty salad sounds fab. Yay! This makes me happy but also sad that we don't live closer! It was SO great to meet y'all and please recreate that salad soon!